Posted By:Unknown | At:1:55 PM Be the first to comment! (Mediaite) The film adaptation of The Help, a novel about the lives and tensions between Mississippi white women and their African American maids, debuts this weekend, and amidst its release it has raised many questions and concerns about the way it portrays the lives of its black characters– though getting rave reviews from Oprah Winfrey and getting a screening at the White House. 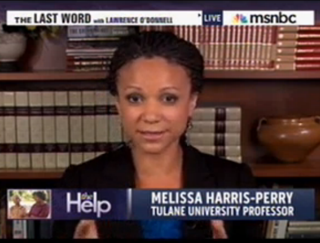 Tulane Professor Melissa Harris Perry was one of the skeptics, who watched a screening of the movie today to review for Lawrence O’Donnell and found it so bad she jokingly demanded workers’ compensation for having watched it. Harris Perry live-tweeted the experience today, making the movie sound nothing short of excruciating for someone who studies race relations for a living, finally concluding that it reduced the suffering of the women of the time to a “cat fight.” She was much calmer on the matter on The Last Word than Twitter, telling O’Donnell that she had gone home to calm down a bit as “it’s really easy to frame an African-American woman feminist talking about a feel-good happy race movie with a critical eye as a killjoy,” and wanted to make clear that the acting and immediate story was entertaining. It was the periphery of that story that Harris Perry took issue with, arguing that “the African American domestic workers become props” for the white protagonist, and that it reduced the struggles of laborers in the South to light Hollywood fare.